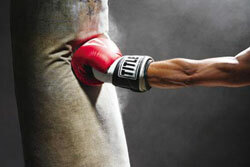 Boxing is a great way to burn calories and let out a bit of aggression. While the sport of boxing may be too dangerous for the average man, there are a ton of great alternatives. 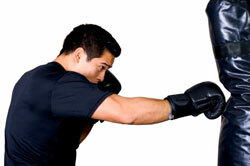 Boxing bags are a great way to experience the benefits of boxing without putting yourself in any real danger. They mimic the weight of a person while cushioning the blow of hard punches. They’re versatile and generally pretty portable, allowing guys to incorporate them into a man cave or backyard. Before you go to town on a punching bag, you need to invest in a pair of quality gloves. Whether you are a novice looking to get ripped or an experienced boxer with loads of experience, gloves are a must-have accessory. Your hands are an important part of boxing and are at a high risk for injury. 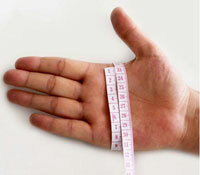 Without a pair of gloves, your hands will be subjected to a high amount of force and damage. Gloves will keep you protected, regardless of how experienced you are at boxing. With that being said, it’s not always easy knowing which gloves to get. While it may seem cut and dry, you’ll find that there are numerous different gloves out on the market. They all have their own specifications and names, making the selection process a bit confusing to those who aren’t experienced. It is important to understand what types of boxing gloves are available and what makes them different. The knowledge will let you choose a pair that works with your hands and your needs. 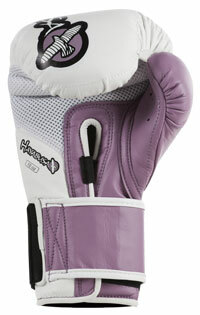 With the right gloves, you can take full advantage of the boxing bag to improve your strength, endurance, and agility. If you’re in the market for gloves, here are a few great options. These gloves will work great with heavy bags. They provide high amounts of protection, allowing you to swing away knowing that your hands are safe and secure. These gloves boast high-quality materials and excellent protection. They are designed to work with heavy punching bags and contain many layers of safety. The inner layer is made up of a breathable fabric to ensure that hands stay dry and comfortable. Over that is a layer of gel lining. This lining is unique in that it absorbs shock and provides a truly custom fit. The lining creates a tight cushion around your hand for ultimate protection. This is followed by multiple layers of foam padding for even more shock absorption, allowing you to punch it out without any problems. 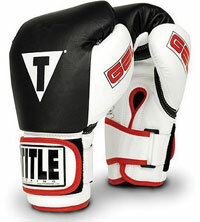 The TITLE Gel World Bag Gloves has an outer layer made entirely of leather. It comes in a few different color schemes and styles suited for both men and women. The various leather panels are double stitched, making it incredibly durable. To get a secure fit, the gloves have an adjustable D-ring with a hook and loop closure. This selection from RDX uses thick layers of gel to create an individualized fit. The gloves use strategically placed layers of gel. This includes a pliable gel section inside the hand. As the hand is inserted into the glove, it wraps around this gel section to protect the inner hand during impact. Additional layers are then wrapped around the hand. The layers around the fingers and knuckles are thicker than around the wrist to ensure that the most vulnerable part of the hand is protected. The outside of the gloves are made from full grain cow leather. The superior leather is durable enough to take grueling punches without stressing. The closure strap wraps around the entire wrist. It’s fully adjustable to any size wrist, allowing you to create a tight fit. With a rugged and stylish design, these gloves are sure to fit into your boxing routine. These gloves use gel and foam to create a protective barrier against your hand and the punching bag. The gel is placed above the knuckles to absorb the shock. The rest of the hand is protected with padded foam for protection. The medium weight of 12 ounces makes it a suitable option for guys who want to build up their strength and endurance. The Ringside Gel Shock gloves come in three bold colors. Guys can choose to go with classic black, intimidating red, or cool blue. They are made entirely of leather and feature the Ringside logo on the outer fist and wrist strap. The strap is made from thick elastic for a tight fit and is part of a hook and loop closing system. From Everlast comes this affordable option. Everlast is an established manufacturer of boxing gear, so you can trust that these gloves are made with proficiency in mind. Unlike pricier options, these gloves are made from neoprene. This material is a durable synthetic rubber that is built to last. The rubber is also very flexible, providing boxers with the movement and elasticity they need. The protective foam inside is pre-curved in a natural and comfortable position. Because it is pre-formed, the foam will keep your fingers and hand in a safe and secure position. Padded palm grips are also included to protect an otherwise vulnerable area. 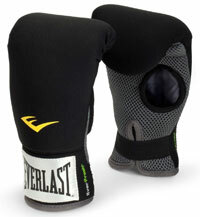 Clad in all black on the outside, these gloves feature the prominent Everlast logo. The inner side of the glove is covered in a gray mesh that improves grip. An elastic strap is used to create a tight fit and keep the gloves in place. As one of the most expensive options on this list, the Hayabusa Tokushu gloves are unique in both design and build. They were specially designed with University research to maximize performance while providing superior protection. The unique technology within the glove skillfully absorbs impact. Its distinct splint system keeps the wrist and hand aligned, which makes the most out of every punch and reduces the chance of injury. Even the materials used are noteworthy. The lining is made from a carbonized bamboo that regulates temperature and has a deodorizing quality. The outside is made from an engineered leather Vylar that is not only incredibly durable, but it also increases punching power. The dual closure system provides the best fit while keeping the wrist in a safe position. With a selection of unique colors and designs available, these gloves are a unique choice that will help you punch like you never have before. The first thing to know about boxing gloves is that they’re not the only thing keeping your hands protected. Underneath the gloves, hand wraps should be worn. Hand wraps are essentially long strips of fabric that are wrapped tightly around the hands and fingers. They help to keep your bones and fingers in place while you box. They are usually made of a breathable fabric to ensure that you still have control and movement. Essentially, there are a few different types of boxing gloves available. They are classified based on what they are being used for. While they all work well for training on bags, their different designs can provide different benefits. Fitness gloves are the most versatile option. They can be used on a variety of surfaces, including heavy punching bags. Because they are so versatile, they are often called all-purpose or training gloves. They differ from other gloves in their construction. They are usually made from synthetic leather that is durable and easy to clean. Fitness gloves are often used on a variety of surfaces, even for seasoned professionals. They have an adequate amount of molded padding to ensure that the hand is protected for punches on everything from a heavy bag to mitts. 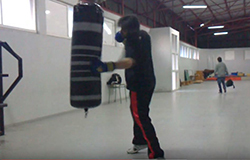 Bag gloves are designed for use on a heavy punching bag. 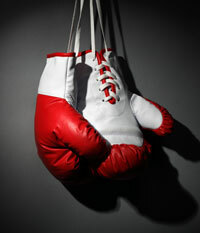 Because bags are generally used for training purposes, bag gloves must be designed to withstand repeated high-impact punches. Not only that, but durability is an essential feature. With both novices and trained professionals, boxing bags are an essential part of daily training. These gloves need to be capable of lasting through daily abuse. Bag gloves have a unique padding system to protect the hands. The padding is molded to provide very specific results. It is sufficiently padded to shield hands from repeated blows and ease the impact on the joints during a workout session. This is important, as it helps reduce pain afterward. Many bag gloves also have unique padding on the knuckles that provide a more natural feel while still shielding them from harm. You’ll be able to connect more with the bag and feel the impact of every hit safely. As the name suggests, sparring gloves are designed to be used when sparring with an opponent. These gloves have extra padding that is strategically placed to reduce the impact on your opponent. They help to keep both parties safe while you spar. They also tend to have better wrist support. While they aren’t specifically designed for bags, many novice boxers use these gloves as they get better. The extra padding will keep your hands safe as you develop your skills. These gloves are for competition use only. If you are merely boxing in the comfort of your own home, you won’t have to worry about getting competition gloves. If you are training for a match, there are specific weight guidelines in both amateur and professional matches. Typically, competition gloves are lighter than the gloves used during training. Size is a huge factor in choosing gloves. You’ll need to choose gloves that fit snug. Loose gloves won’t protect your hands adequately and could ultimately fall off as you are training. When trying on gloves, it is also important to take hand wraps into account. The weight of the glove is another thing to consider. A heftier glove will have more padding and protection. It is generally a good idea to go with a heavier glove as you train. Not only does this allow you to swing away without having to worry about injury, but it improves your overall endurance. If you train with heavy gloves, your swings on lighter gloves will become quicker and more precise. Boxing gloves can have a few different types of closures. While they may not seem like a huge deal, the way a glove closes can affect its overall fit and comfort. Hook and loop closures are common among all types of boxing gloves. They are quick and easy to adjust at a moment’s notice. The most versatile option is lace. Lace closures give you full control of the tightness of the glove. However, they can be a pain to take on and off, often requiring the help of another person. Other options include elastic bands and velcro.